Benjamin “Bibi” Netanyahu is a former Israeli special forces commando, diplomat and politician. He is currently the 17th Prime Minister of Israel. Netanyahu (born October 21, 1949) was born in Tel Aviv, grew up in Jerusalem and spent his adolescent years in the United States, where his father Benzion– a noted historian – taught Jewish history in Philadelphia. In 1967, at the age of 18, Netanyahu returned to Israel to fulfill his military obligation in the Israel Defense Forces and volunteered for an elite commando unit. During his service, he participated in a number of daring operations including Operation Gift during the War of Attrition that freed hostages from a hijacked Sabena Airlines aircraft being held in Beirut, Lebanon. Netanyahu was wounded during this operation. He was discharged from the IDF after six years of service having attained the rank of captain following the Yom Kippur War. Following his discharge, Netanyahu studied at MIT in Boston and received a B.S. in architecture and an M.S. in Management Studies. He also studied political science at MIT and Harvard University. In 1976, he was employed by the Boston Consulting Group, an international business consulting firm, where he befriended future American presidential hopeful Mitt Romney. Netanyahu later joined the management of Rim Industries in Jerusalem. Much affected by the death of his eldest brother Yoni Netanyahu – who had famously fallen while commanding the 1976 Entebbe rescue operation to free the passengers of an Air France airliner held hostage in Uganda – Bibi initiated and organized two international conferences on ways to combat international terrorism, one in 1979 in Jerusalem and the other in 1984 in Washington, D.C. These forums attracted key political figures and opinion-makers in the international community. In 1982, Netanyahu joined Israel’s diplomatic mission in the United States, serving for two years as Deputy Chief of Mission under Ambassador Moshe Arens. He was also a member of the first delegation to the talks on strategic cooperation between Israel and the United States. In 1984, Netanyahu was appointed Israel’s ambassador to the United Nations and held this position for four years. As U.N. ambassador, Netanyahu led the effort that opened the U.N. Nazi War Crimes Archives in 1987. An articulate speaker, forceful debater, and media-oriented diplomat, he played a key role in efforts to enhance Israel’s image and improve understanding of the country’s security needs among the American public and political elite. After returning to Israel in 1988, Netanyahu entered the political arena and was elected a Member of Knesset from the Likud party and was appointed Deputy Minister of Foreign Affairs. He served in this position for four years that were marked by the First Intifada, the 1991 Gulf War, and the Madrid Peace Conference. 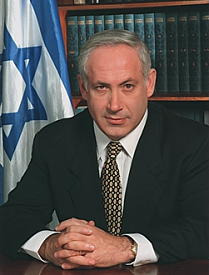 On March 25, 1993, Netanyahu was elected Chairman of the Likud and its candidate for prime minister. He led the political opposition in the period prior to and following the assassination of Prime Minister Yitzhak Rabin – a time characterized by volatile public debate over the Oslo agreements and escalating Palestinian terrorism. Many Israelis on the political left accused Netanyahu and his supporters of creating the conditions in which Rabin could be killed by a fellow Jew through their extreme rhetoric denouncing Rabin and the agreements he signed with the Palestinians. In 1996, in the first direct elections of an Israeli prime minister, Netanyahu defeated incumbent Labor candidate Shimon Peres, and became the thirteenth prime minister of the State of Israel (and the ninth person to hold the position). He served in the position until the May 1999 elections when Labor Party leader Ehud Barak won the premiership. After completing his term as Prime Minister, Netanyahu served as a business consultant to Israeli high-tech companies and was a popular speaker on the global lecture circuit. In 2002, he returned to politics, first as Minister of Foreign Affairs (November 2002 - February 2003) and then as Minister of Finance until August 2005. In the February 2009 elections for the 18th Knesset, following the resignation of Prime Minister Ehud Olmert, Netanyahu’s Likud Party won the second most seats; nevertheless, he was given the opportunity to form coalition government since the Kadima Party, which won the most seats under the leadership of Tzipi Livni, could not secure a majority. During Netanyahu’s second term as prime minister, relations with the United States became frayed due to the lack of chemistry and policy differences with President Barack Obama. At the outset of his term, Obama made a number of decisions that upset Israel’s leaders, notably his decision to give a speech in Cairo without also visiting Israel, and demanding that Israel freeze settlements to reinvigorate the peace process with the Palestinians. Obama’s insistence that Israel stop building in East Jerusalem was particularly galling as Israel considers the entire city its capital and rejects the notion that Jews living there are “settlers.” Obama’s demand also went further than the Palestinians’ position to that point as they had negotiated with Netanyahu’s predecessor, Ehud Olmert, without insisting that Israel stop building settlements. Netanyahu reluctantly agreed to a 10-month settlement freeze in the West Bank but not Jerusalem. Despite the concession, Palestinian Authority Prime Minister Mahmoud Abbas refused to enter negotiations for the duration of Obama’s term. In May 2011, Netanyahu spoke before a joint session of the U.S. Congress and voiced his support for the creation of a Palestinian state, noting however that such a state would have to be demilitarized and could only be formed through direct, bilateral negotiations between Israel and the Palestinian Authority. In October 2012, Netanyahu and Foreign Minister Avigdor Lieberman, head of the Yisrael Beiteinu Party, announced the merger of their two parties and plans to run on a joint ticket in the January 2013 general elections. During those elections, the Likud-Beiteinu partnership garnered a plurality of 31 seats and, in March 2013, Netanyahu formed a majority coalition with the Yesh Atid Party (Yair Lapid) and The Jewish Home (Naftali Bennett). This 33rd government was sworn in on March 18, 2013, with Netanyahu as prime minister. He also retained for himself the portfolios for foreign affairs and public affairs. Netanyahu declared victory over his political rivals as the last of the votes came in on the morning of March 18, 2015. The Likud Party received enough votes for 30 out of 120 seats in the Knesset, with the Zionist Union camp coming in second place, receiving enough votes for 24 seats. Netanyahu’s last minute appeals to right-wing voters, which included what some commentators interpreted as a racist claim that Arab citizens were voting in “droves,” energized his base and helped his party win the election. Netanyahu’s comments infuriated the Obama administration, prompting Netanyahu to apologize for the remark about Arab voters and backpedal on his comments regarding a Palestinian state. In an interview on MSNBC, he insisted that he had not changed his policy from his 2009 speech at Bar-Ilan University, but qualified his remarks by saying he was committed to Palestinian statehood only if the conditions in the Middle East improved. Relations with the United States became especially tense over the issue of Iran as Obama’s Secretary of State John Kerry negotiated a deal aimed at preventing Iran from obtaining a nuclear weapon. When Netanyahu accepted an invitation to address a joint session of Congress in March 2015 to express his opposition to a deal with Iran, without first consulting the White House, relations with the administration reached their nadir. The election of Donald Trump led to a dramatic reversal in relations with the White House as the new president expressed unabashedly pro-Israel positions during his campaign and at the outset of his administration, highlighted by the decision to recognize Jerusalem as Israel’s capital and move the U.S. embassy there from Tel Aviv. Netanyahu has been married three times. Netanyahu’s first marriage was to Miriam Weizmann, whom he met in Israel. The couple had one daughter, Noa (born April 29, 1978). While Weizmann was pregnant, Netanyahu met a non-Jewish British student named Fleur Cates and began an affair. His marriage ended in divorce when his wife discovered the affair. In 1981, Netanyahu married Cates, who converted to Judaism. The couple divorced in 1984. His third wife, Sara Ben-Artzi, was divorced and working as a flight attendant for El Al when they met. She was in the process of completing a master’s degree in psychology. The couple married in 1991 after she became pregnant and have two sons: Yair and Avner. In 1993, Netanyahu confessed on live television to having had an affair with Ruth Bar, his married public relations adviser. He said that a political rival had planted a secret video camera that had recorded him in a sexually compromising position with Bar, and that he had been threatened with the release of the tape to the press unless he quit the Likud leadership race. Netanyahu and Sara repaired their marriage, and he was elected to the leadership of Likud. Netanyahu has remained popular in Israel due in part to his tough stands against terrorism and Iran, a thriving economy, and a lack of serious opposition even as he and his wife Sara have come under investigation for a number of scandals. A report into the spending of Netanyahu prepared by State Comptroller Yosef Shapira was released on February 17, 2015. Included in the report were records of extravagant spending by the prime minister and his wife at their official residence, such as $18,000 spent on takeout food in a single year, despite the fact that they were provided with a personal chef with a full staff at their residence. The Netanyahus reportedly also spent $2,120 per month cleaning their beach home, and the cleaning costs at their main residence in Jerusalem mysteriously doubled to more than $300,000 between 2009 and 2013. Included in the report as well are allegations that government employees were asked to pay out of pocket for many of the prime minister’s personal expenses, and were not reimbursed. No charges were filed as a result of the 2015 report. On June 21, 2018, however, Sara was indicted on charges of fraud and breach of public trust after falsely misrepresenting the employment status of cooks at the prime minister’s official residence and fraudulently spending an estimated $100,000 on takeout food orders between 2010 and 2013. “Case 1000” involves allegations that Netanyahu, Sara and their son Yair received lavish gifts from Israeli-born Hollywood mogul Arnon Milchan and Australian billionaire James Packer. Netanyahu allegedly received from Milchan roughly $70,000 worth of cigars, $55,000 in bottles of champagne and $3,000 in jewelry for Sara in exchange for helping Milchan with an investment in the Keshet channel. He was also accused of telling an IDF officer to provide Milchan an IDF helicopter to go to Jordan for business. “Case 2000” involves allegations that Netanyahu tried to strike a deal him with the publisher of Israel’s second largest newspaper, Yedioth Achronot, to get more favorable coverage in exchange for taking steps to weaken Yediot’s rival, Israel Hayom, which has enjoyed a competitive advantage because it is a free newspaper. Ironically, Israel Hayom, is viewed as sympathetic to Netanyahu and owned by his avid supporter, American billionaire Sheldon Adelson. Publisher Arnon Mozes also allegedly agreed to attack Netanyahu rivals Naftali Bennett and Moshe Kahlon. “Case 3000,” also known as the “Submarine Affair,” involves allegations of bribery in a submarine deal between Israel and Germany. Netanyahu has not been directly implicated in the case; however, his former bureau chief has been suspected of taking bribes in the case. “Case 4000,” also known as the “Bezeq affair,” accuses Netanyahu of receiving positive coverage from Walla! in exchange for helping the company’s owner make nearly $190 million. Shlomo Filber, director general of the Communications Ministry and a former top aide to Netanyahu was believed to have given Bezeq confidential documents and other information from which the company stood to benefit. After three years of investigation during which 140 witnesses gave evidence, Israel’s Attorney General Avichai Mendelblit announced on February 28, 2019, his decision to indict Netanyahu in Case 4000 for bribery and breach of trust; in Case 1000, for fraud and breach of trust and, in Case 2000, for breach of trust and fraud. Mendelblit also said he would not pursue indictments against Netanyahu’s wife Sara or his son Yair. Netanyahu responded to the charges by insisting there was no connection between his actions regarding Bezeq and the coverage by Walla!. He said that his decisions made as communications minister were reasonable and done with the support of the ministry’s staff. He also argued the evidence there had been no quid-pro-quo was the hostile coverage he continued to receive from the publication.. In Case 1000, Netanyahu said he was allowed to accept gifts from friends and had never solicited them. He maintained there was no quid-pro-quo with Milchan. In Case 2000, Netanyahu said he was being treated unfairly because others who were friends of Milchan were not questioned. He also claimed that he and Arnon Mozes were not being serious during recordings of them exchanging commitments. Some of Netanyahu’s rivals immediately called for him to resign, but he said he had no intention of doing so. Many supporters rallied to his side, but a Times of Israel poll taken on the eve of the announcement indicated the indictments could affect the results of the election scheduled for April 9, 2019. The survey indicated Netanyahu’s Likud Party would lose four seats – from 29 to 24 – while the new Blue and White party of Benny Gantz and Yair Lapid would win 44, up from 36 prior to the announcement. Much could change, however, in the final 40 days of the election campaign. Unless Netanyahu resigns and accepts a plea deal, a prospect considered highly unlikely at the time of the indictments, it was expected to take several months before Netanyahu would face any charges in court. Netanyahu has written a number of books that appeared in Hebrew and English, with some also translated into Russian, French, Arabic, Japanese and other languages, among them Self Portrait of a Hero: From the Letters of Jonathan Netanyahu 1963-1976 (edited 1978), International Terrorism: Challenge and Response (edited 1979), Terrorism: How the West Can Win (edited 1987); A Durable Peace: Israel and Its Place Among the Nations (1992); and Fighting Terrorism: How Democracies Can Defeat Domestic and International Terrorism (1996). David Margolick, “Star of Zion,” Vanity Fair, (June 5, 1996). Yonah Jeremy Bob, “Four Top Revelations From Netanyahu's Charge Sheet,” Jerusalem Post, (February 28, 2019).